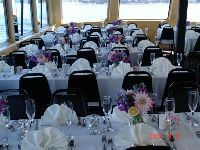 Treat your guests to a beautiful trip along the shores of Minnesota and Wisconsin on the Scenic St. Croix River. The professional, courteous staff and crew of our vessels will accommodate all of your needs. Catering is prepared from the kitchen of the Afton House Inn restaurant. Dinner is served buffet style. Full bar service available for your social time. Special sit-down dinner arrangements are available. Enjoy our excellent cruise menus. Afton * Hudson Cruise Lines Sales Department will help make your job at ease with the assistance in all your details for any personalized Menus, Entertainment and Fresh Floral Arrangements.